Please note that we are not early years specialists, nor are we teachers. We are parents who want to inspire children to learn and develop. These ideas are just some simple ways to help your children learn and have fun at the same time. You could show the cards to babies and talk to them about the words and pictures on the cards. Just simple things like, "Cat", "It's a cat", "Look at the cat", "A lovely friendly cat". By doing this you are introducing them to words which they will start to associate with the image. You could use the cards to introduce colours to your babies. "A green tree", "An orange hat", A purple book". This is a great way to help your babies start to recognise colours". The flash cards also look beautiful as nursery decor. By having the cards displayed in their room your babies will soon start to become familiar with the images. As they get older you could talk to them more about them and gradually increase their understanding. For toddlers, you could continue to build upon the ideas above and also try some of the folloiwng. Once your child's understanding of language starts to really develop you could ask them to find cards for you. "Where is the dog? ", "Please can you pass me the paintbrush? ", "Can you find the nest?" You could lay out out some of the cards to make some funny short sentences. Perhaps "A dog sat by a tree", "A cat put on a hat", "The king ate some jelly". This will help show your toddler how words are put together to make sentences. You could lay out all the number cards and go through them in order saying the numbers out loud. You could also point to each of the characters on the number cards and count them. These activities will help introduce your little ones to numbers and before long they will start to say numbers back to you. Maybe not in the correct order but they will start to learn the words for the numbers. The order will come in time, for now repetition is key! You could use the cards to talk about what you are going to do that day. if you are going to the park you could show them the tree. If you are going to do some crafts you could show them the paintbrush. If you are going to play outside you could show them the garden. If it is a sunny day you could show them the sunshine. The cards become part of your day! Finally, here are some fun ideas for using the flash cards with preschoolers and older children. Your little ones could start to trace over the letters and numbers with their fingers in order to take the first steps towards writing. You could also ask them to trace them out onto seasonal objects such as conkers, shells, leaves. Drawing the letters and numbers for them in sand and asking them to copy them is a great way for them to start to develop their writing skills. The sand could be in a box or tray or if you are near the seaside, have some fun with letters and numbers on the beach. You may also have foam or magent letters and numbers at home. If you do, you could ask your child to find the matching letter or number and place it on the card. You could pick one of the cards and ask your child to find objects in the house or out and about that start with the same letter. They might also start to spot the letters on shop fronts, advertising boards, side of vans. Once they start to enjoy finding letters in their environment there really is no stopping them! You could pick a card and ask your child what the letter is and the corresponding illustration on the card. You could then say to them, "What other words do you know that begin with....?" You could pick one of the letter cards and ask your child what other words rhyme with that word. "What rhymes with cat?" "Bat, hat, sat, mat etc." Once they learn about rhyming words you could start to make up some funny rhyming poems with them. They will be sure to make them laugh! You could use the cards to show your little ones how to spell words. You will only have one of each letter (unless you have multiple packs of course!) but there are still lots of words you can spell out. For example, wand, hat, tiger, lion, five, home, shop, park...etc. You could incorporate the words and numbers into sentences and even make up stories. For example, "One day, a Queen was walking in her garden and saw three fish swimming in the pond. Two of the fish were very excited because they had seen a rainbow. The other fish was sad because he hadn't seen it. The Queen wanted to make the fish happy again so she took out her wand and pointed it up to the sunshine in the sky. Magically another rainbow appeared and the fish was very happy." You could place all the cards upside down and ask your child to turn over a few at random. Then have lots of fun making up silly sentences together. The octopus tickled the zebra with a paintbrush. We love memory games as they are such a great way to develop a child's memory whilst having lots of fun at the same time. You could lay out some of the flash cards and ask your child to tell you what they are. Then ask them to close their eyes whilst you take one away. Then ask them to open their eyes and tell you which one is missing. Once they get the hang of it you can use more cards to make it trickier and could also take more than one away. You might be quite surprised by their memory skills! We hope you like these ideas and as we mentioned above if you have some other ideas, we'd love to hear from you. Thank you to all the lovely mums from the Books and Pieces Parent Panel who contributed to this post too. 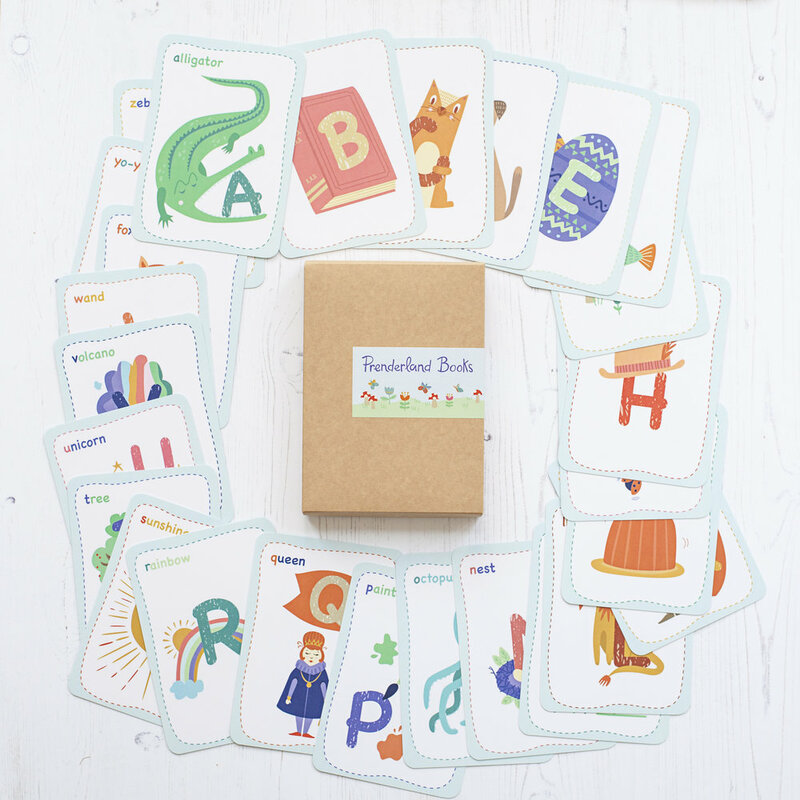 Our fun and colourful alphabet and number flash cards are available in our shop. 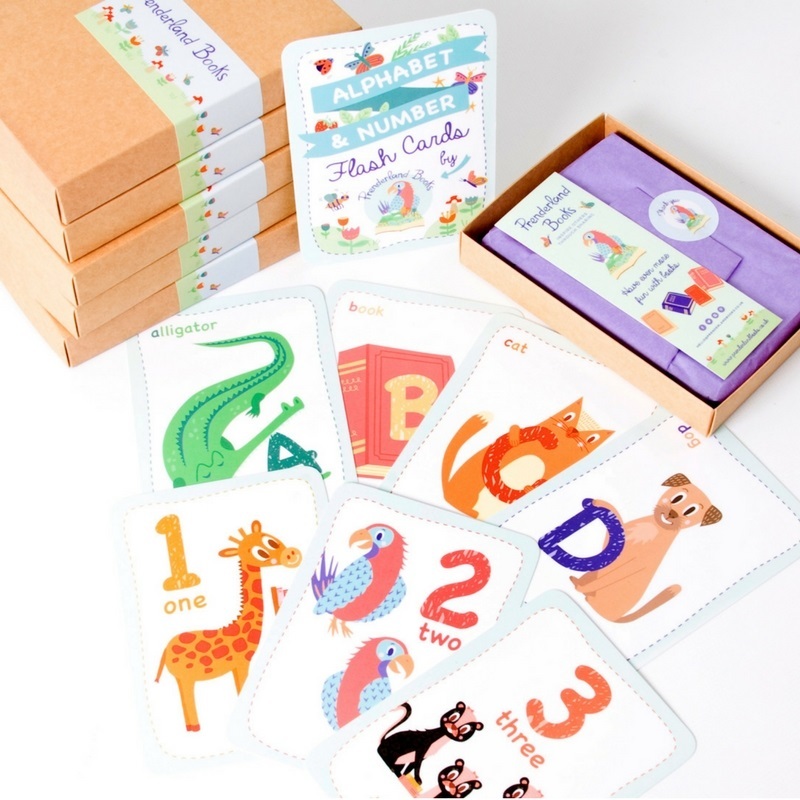 Each set contains an illustration for every letter of the alphabet and for the numbers one to ten. Have fun with flash cards!